We, at Alpine Communications, believe connected communities become thriving communities. Across the nation, we are entering into a new era of connectivity. Staying connected, in recent years, has proved to be revolutionary to the way we live our lives. People are now empowered to work from any location they desire, meet people with common interests from around the world, and shop, talk and earn a living from the comfort of their own homes. For many, this level of connectivity is an added bonus to their already-connected lives. For others, especially those living in rural communities like ours, connectivity is life changing. No longer do our rural residents who have ambitious career aspirations have to move out of their rural communities to bigger cities. They can create a thriving professional network in the hometowns they love. This means families are able to stay closer together and put down generational roots in the community they love. No longer do those with very specific hobbies and interests have to feel alone because they can’t find others in their community to meet with. They can now join a community, connect with others from around the world and feel a sense of belonging in the network they chose. 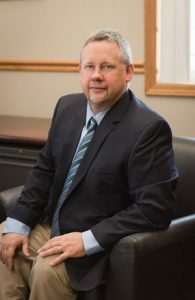 Chris Hopp has dedicated 25 years to connecting communities. And no longer does a relationship have to suffer from distance. Individuals can connect with those they love in many different ways, with the help of technology, helping them feel just as close to someone as if they were sitting down together at the dinner table. This is why we believe when we each have the power to connect, we can be immersed in the parts of life that mean the most to us. As humans, we need connections. It’s vital to our emotional and physical health to not only connect with others individually, but to be involved in thriving communities where we can share interest, talents, knowledge and commonalities. It gives us a sense of purpose. At Alpine Communications, we see the need for connectivity, and our role in championing that connectivity. It’s a responsibility we take seriously and with pride. This is why we’re so much more than a communications provider. We understand we are the intermediary between those in our community and the connections they need to lead rich, well-rounded lives. When you choose Alpine Communications, you are also choosing to align with our commitment to help you create thriving communities. The more we can connect, the stronger communities we can create together. Interested in reading stories about how we’re creating thriving communities? Be sure to follow us on YouTube, Facebook and Twitter.